After close to 3 years of amazing Secretsundaze 'All Night Long' parties at The Pickle Factory, Giles and James have decided to switch things up. Having 8 hours to play all night, each month has been a real joy, but they both felt they wanted a change. With the larger flagship events at Oval Space being a platform to invite the cream of world class talent, the Pickle Factory will become more of a testing ground - a place for experimentation, a place to support fresh, young or underrated and as much as possible local talent. 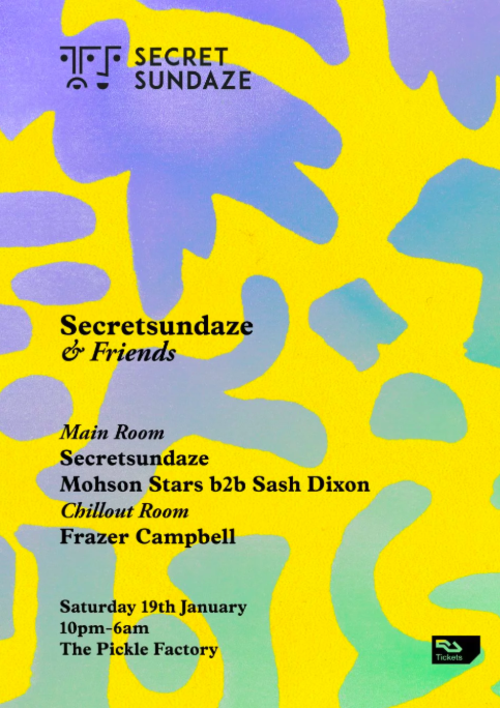 We’re really happy to invite Mohson Stars and Sash Dixon to warm things up for us at the next Secretsundaze and Friends. They are both true friends of Secretsundaze having been coming to the parties since wayyyy back when. Mohson runs the ‘Keep it Deep’ Blog which has invited the likes of DJ Qu, Finn Johansen and Afrikan Sciences to contribute podcasts and Sash is really solid DJ with great taste across the board but always with a leaning to deep soulful music be that hip hop or real deep house. Check her shows out on Balamii. Also joining us playing in the chill out room for a special ambient set is another old connection the loveable beardy Frazer Campbell! Coming to Secretsundaze on and off for many years Frazer has gone on to do great things in recent years from the creation of his label Elliott Project to his collaborations with deep minimal groove king Steve O’Sullivan.